There’s something just so cozy and inviting about a home decorated with warm shades of brown. Neutral tones are the perfect backdrop color no matter what your design style is like. It’s such a popular color choice for rooms and can turn any basic area into a relaxing rustic retreat. When it comes to finding the perfect brown décor pieces to use in your home, first think about what style best speaks to you. Do you prefer a rustic farmhouse style, a nautical theme or another popular design idea? Choosing a beautiful brown to use in your home really sets the foundation for your design. When decorating with a more traditional concept in mind, dark brown stained hardwood flooring with muted wood cabinets will provide a modern yet classic look for your space. When it comes to furnishings, bring in a few different shades of browns with various textures to really enhance your living space. If you are decorating a room with lots of natural lighting, you may want to opt for a lighter shade of brown that won’t take away from your beautiful view. Finding the right warm shade of brown makes all the difference in a home so here are a few design ideas to use as inspiration. 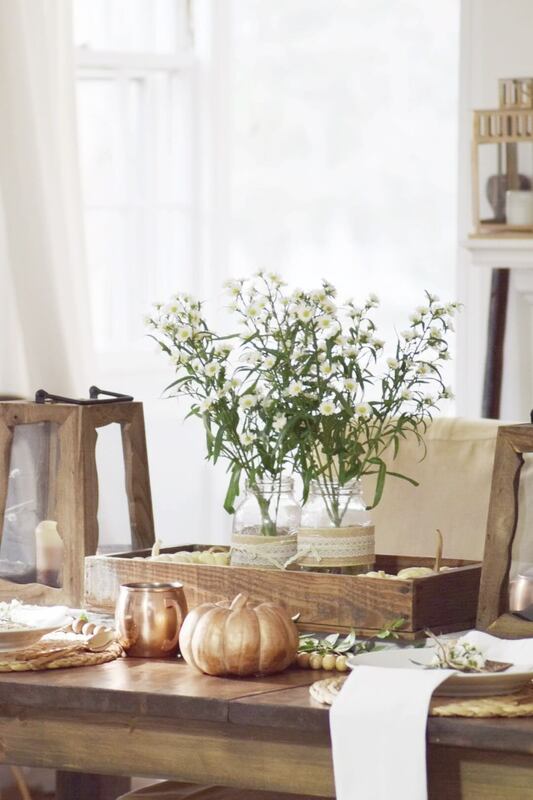 Bring a touch of nature indoors with this classic rustic centerpiece. There are so many versatile ways to decorate with a planter box and this one might just be one of my favorites. You can switch out the flowers depending upon the season and you can fill it with nearly anything for a unique and creative appeal. The wooden candle lantern is a beautiful addition and adds a perfect touch of country style. 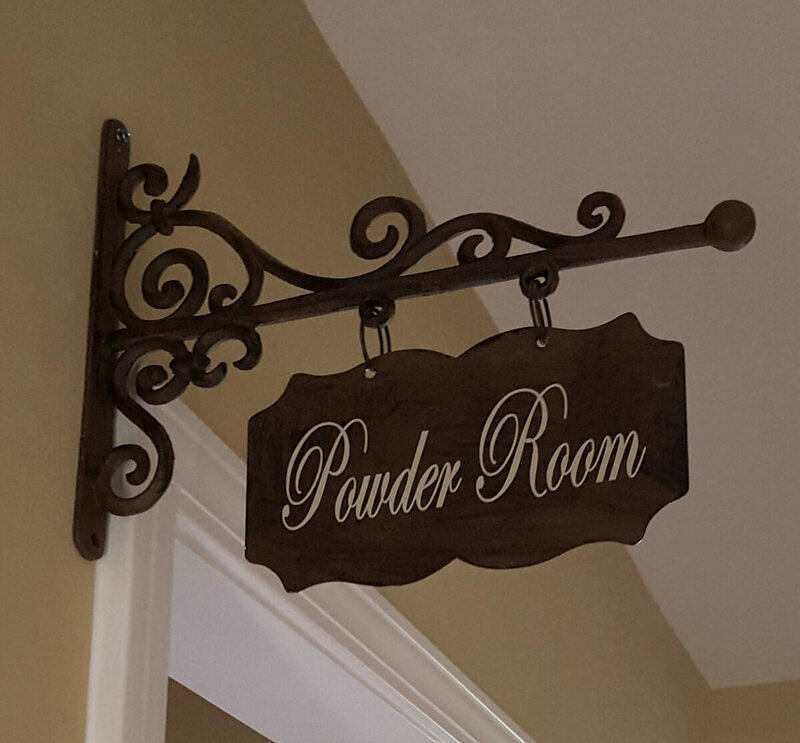 There are just so many options when it comes to adding a customized wood sign to your home. 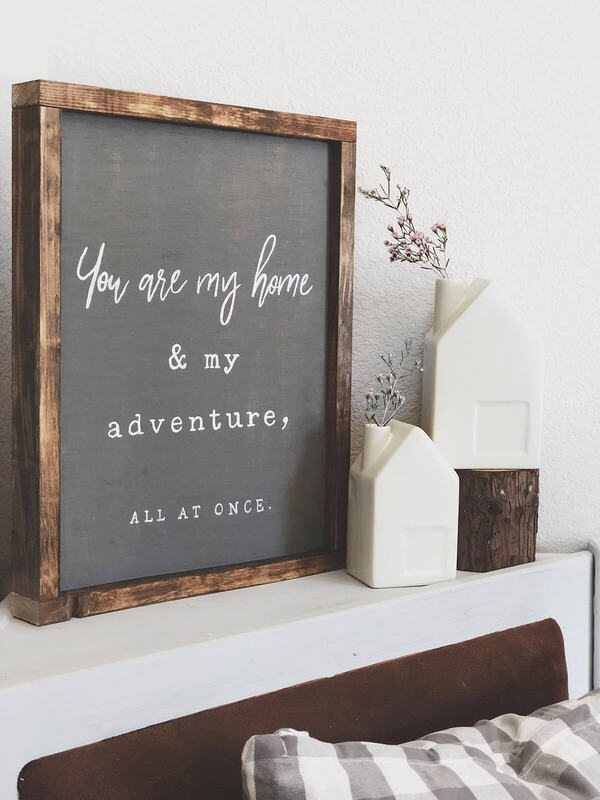 Whether you want something for the living room, bathroom or even the front porch, chances are you can find a wood sign to fit your space perfectly. 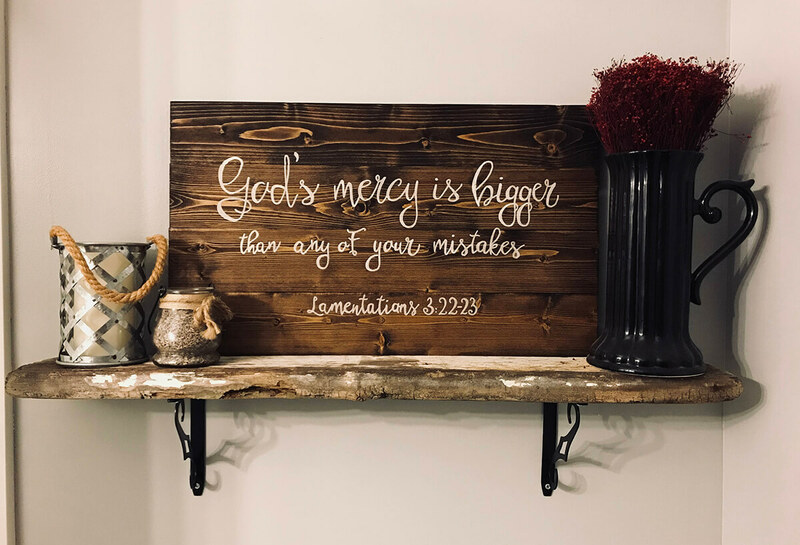 This wooden sign displayed on a shelf adds dimension and character, not to mention a great way to showcase your personal style and values throughout your home. Irresistible and simple, this circular wooden sign makes the perfect addition to your doorstep. 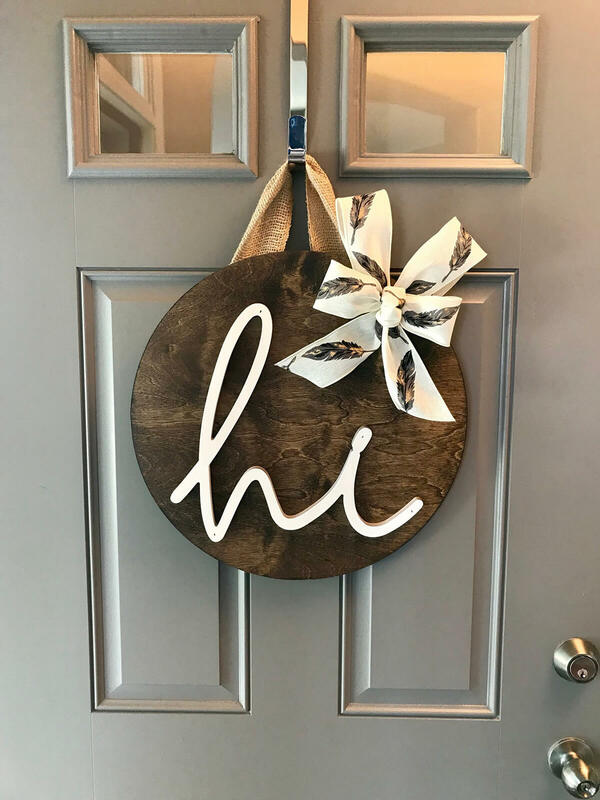 This gorgeous wreath adds a personal touch with a short saying welcoming each guest into your home. The burlap detailing provides a cozy farmhouse feel and the ribbon really tops it off with the subtle feather print. The customized options with a wooden wreath like this one are infinite! You could add a monogram, an outline of a flower or any other design you wish. Succulents are quite popular right now. Cactus, aloe, jade and many other succulent plants are making major appearances in homes this year. 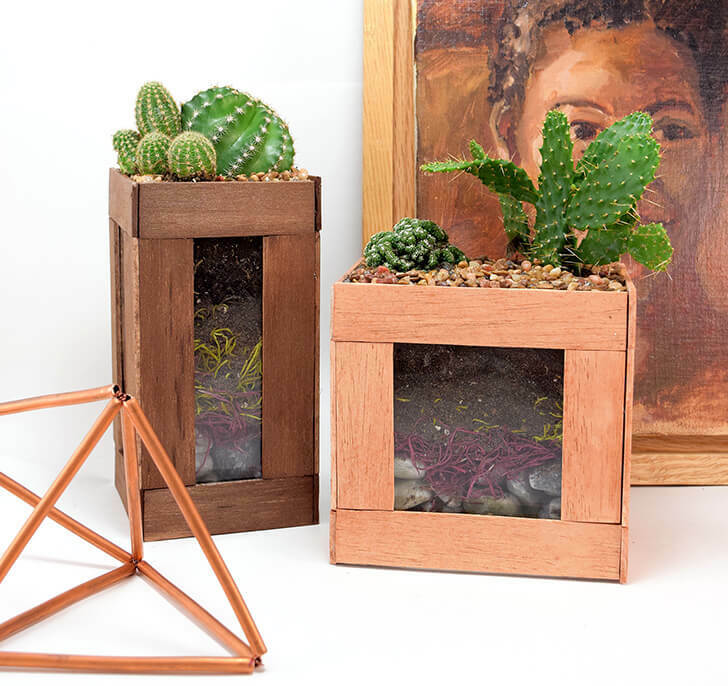 A small succulent garden is such a beautiful warm brown decor piece that will fit perfectly in any room of the home. I really love the clear front so you can see the growth and life of the cactus. This arrangement would look great on a table, desk, shelving, or even on the countertop. Compliment your existing home décor with a few brown accent pieces. 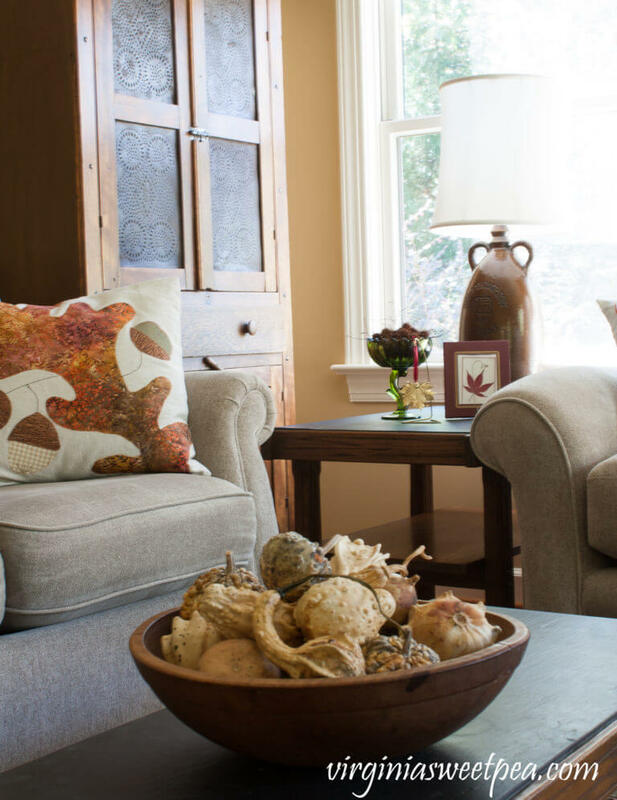 For fall, placing neutral toned gourds in a wooden bowl is the perfect accent décor piece for your living room table. Adding a throw pillow with shades of brown to compliment your couch and displaying a lamp on an end table really ties in all of the shades of brown together. This is a warm brown decor idea that feels so warm and inviting. Shabby chic is also sometimes known as a farmhouse or country style that is very warm and friendly. Many people enjoy this style of décor because of its simple, natural and weathered look. 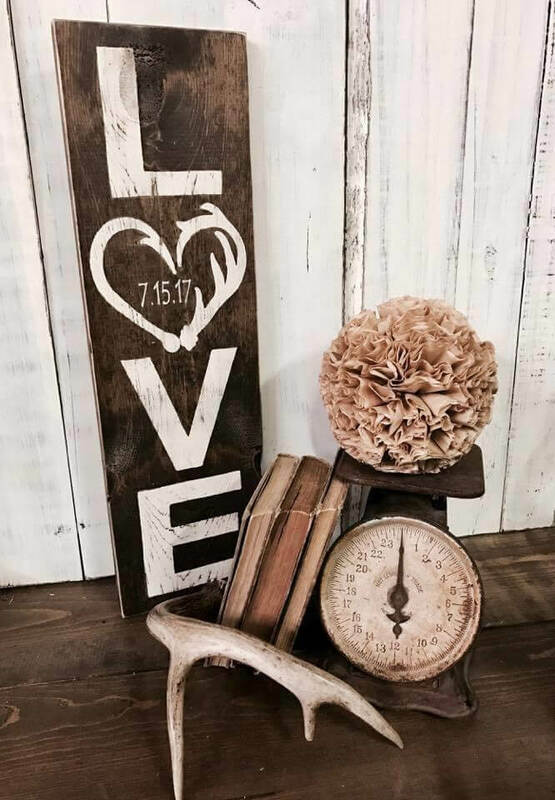 This wooden sign is the perfect focal point to this shabby chic arrangement of flowers, books, an old vintage scale, and antlers. The warm brown tones all work perfectly together for a charming balance. 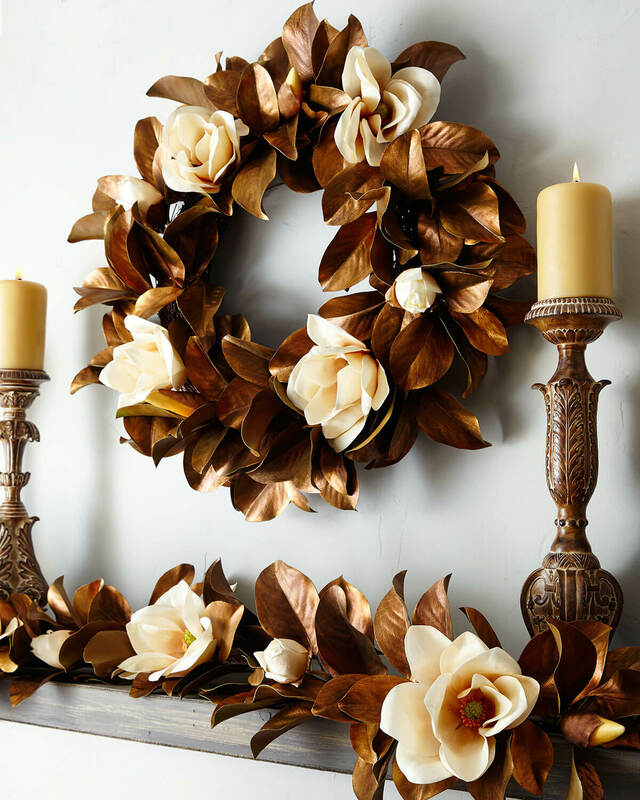 Artificial wreaths and garlands are sure to liven up any area of your home. This wreath and garland display over the fireplace is perfect for fall and the neutral brown colors pair perfectly into your everyday décor. The candles along the side of the wreath are a great addition and add height and texture to this focal point. Incorporating wooden feature pieces blended with simple statement pieces really gives your home a comfy, yet sophisticated vibe. There’s something so personal and touching when displaying a wooden sign with your favorite quote in your home. It’s such a fun and unique way to tell a story or share a memory for your guests and loved ones to see. Another warm brown decor idea that is very popular is the full-length wooden sign. This wooden sign is a great addition to any home. We love the dimension and texture of this sign. The wreath in place of the “o” really adds visual appeal and is an eye-catching piece of décor. Brown sofas don’t have to be basic and boring. A brown sofa is extremely practical and forgiving when it comes to stains and dirt, which makes it a smart choice when it comes to choosing your furniture. Lighten up the room by adding a few accent pieces to lighten up the space a bit. 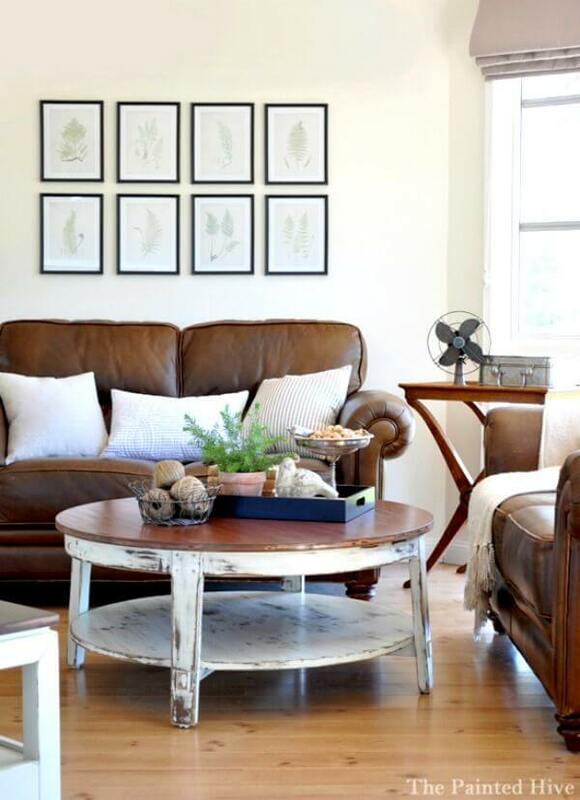 The white pillows keep the couch from looking too plain and the distressed round coffee table adds the perfect rustic charm. It’s easy to see why these wooden signs are a hot new decorating trend. They’re versatile, homey and never out of place. It’s a simple way to spruce up your space and can save you hundreds of dollars by making a DIY version right at home. 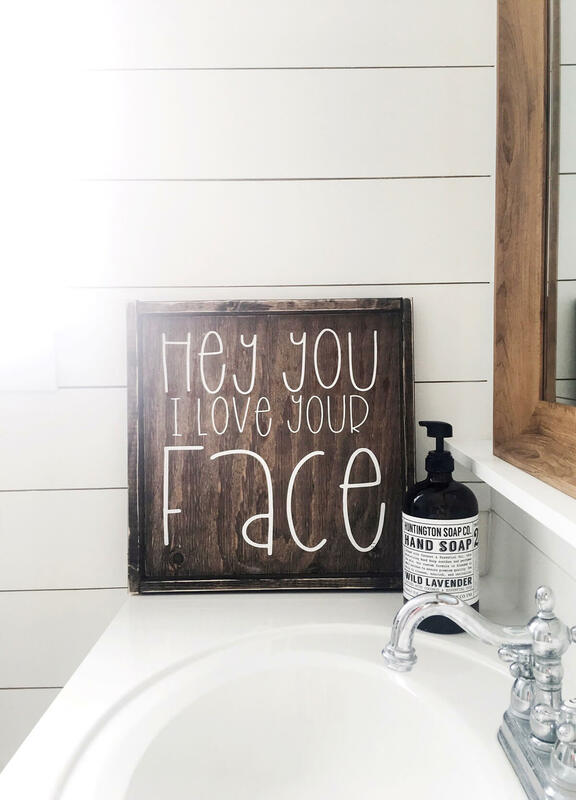 This wooden sign displayed in the bathroom is a simple addition, yet fits this space so perfectly. The very first thing that comes to mind when I hear nautical décor is ropes, boats, and anchors. 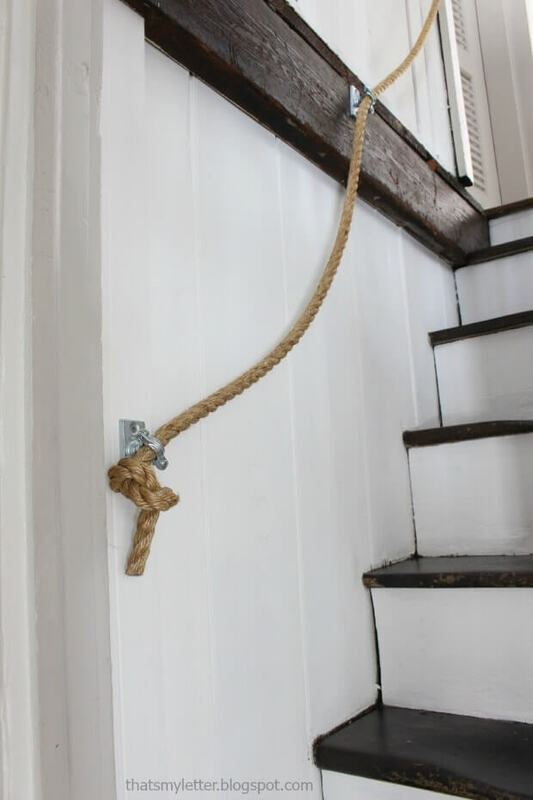 This rope stair railing is such a unique design that is so simple, yet boasts that nautical vibe. It’s such a creative design concept that really brings out the wood detailing on the steps and wooden slab. The first thing people see when they enter your home is your entryway. This is a space often overlooked when it comes to decorating but is an important part of your interior design. 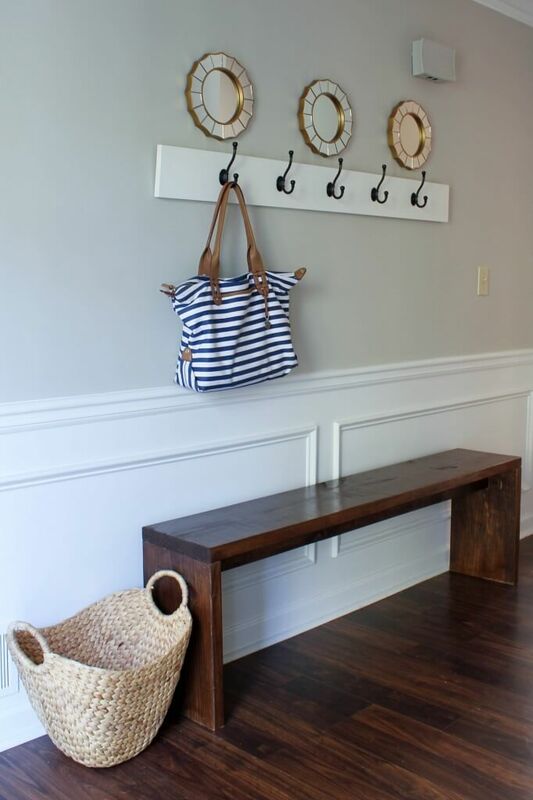 This wooden bench entryway is stylish and will make your guests feel welcome. It’s a functional space where your guests can sit, take off their coats and shoes and make themselves at home. Adventure awaits this sweet rustic retreat. 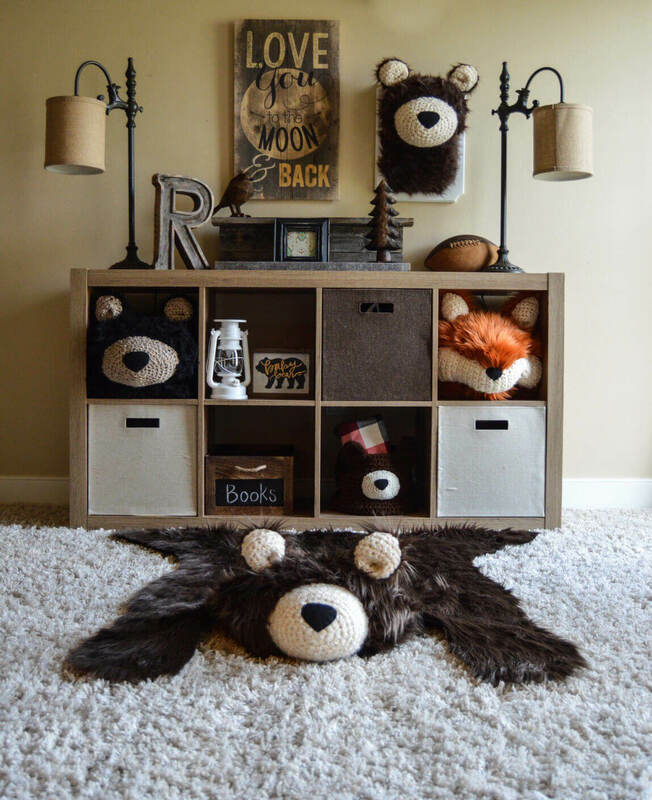 The theme of woodland animals and outdoorsy décor is a popular design when it comes to decorating a little boy’s room. The nature-inspired elements from the animals, burlap lamp shades and brown wooden details really make this space feel warm and cozy. The perfect retreat for any little one seeking adventure. Your bedroom should be the most relaxing place in your home. 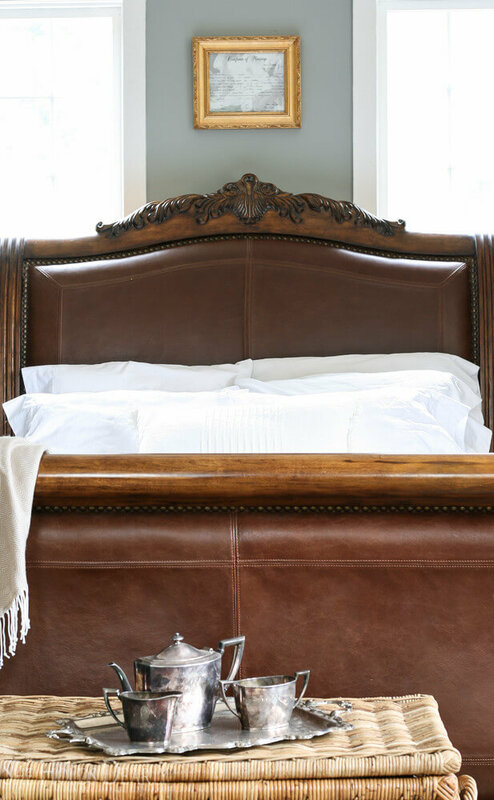 The leather and wood detailing on this platform bed looks crafted for comfort. The earthy browns in this room work so well together to create the ultimate cozy space to wind down every day. The stainless steel teacup set resting on the wicker storage bin really adds a finishing touch to the room. There’s something about vintage décor that exudes heart and style. This vintage-inspired, western wooden sign adds a nostalgic touch to your home. I really love how there’s a hint of feminine with the font style. It’s the perfect warm brown design idea for the bathroom and will be such a fun conversational piece when you have guests over. Creating your own personalized wall art is the easiest way to add unique personality to your home. 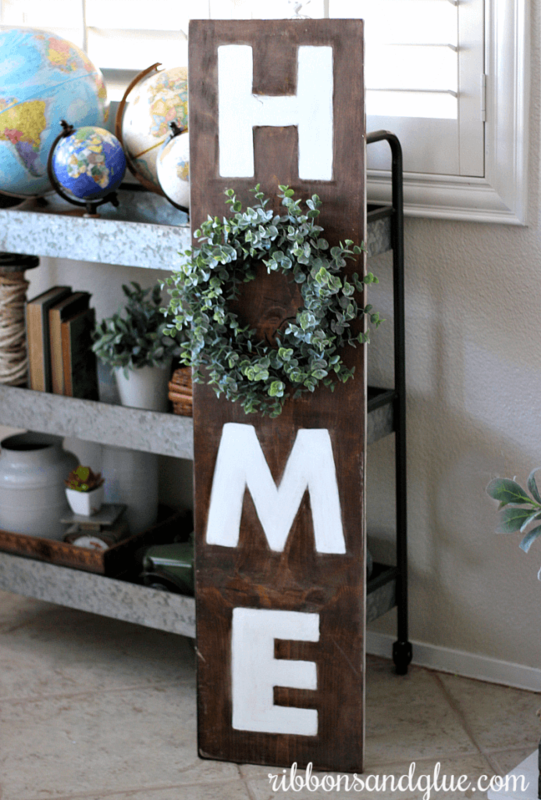 A DIY pallet sign is a simple way to give your living space a rustic, farmhouse feel. 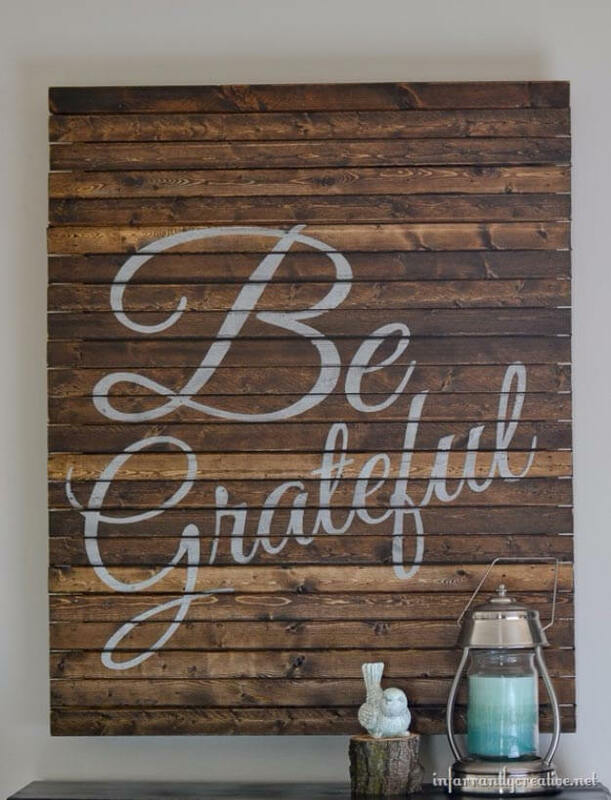 This wooden sign is uplifting and inspirational and serves as a great reminder to always be grateful. So grab a pallet, some paint, and a brush and get started! Chocolate brown walls can look either very traditional or very modern. It’s such a neutral color that can completely cover an entire room or painted on a single side as an accent wall. 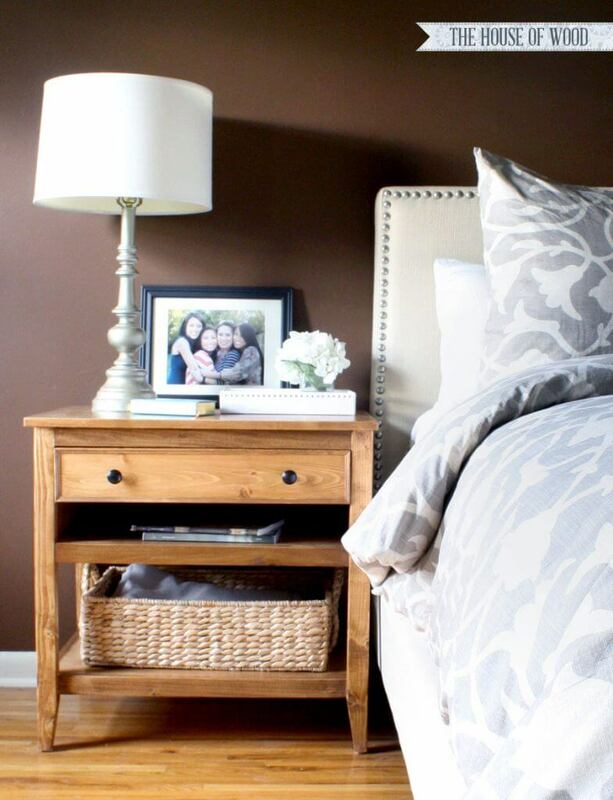 The wooden brown nightstand and lamp add a light and earthy feel that really completes the room. 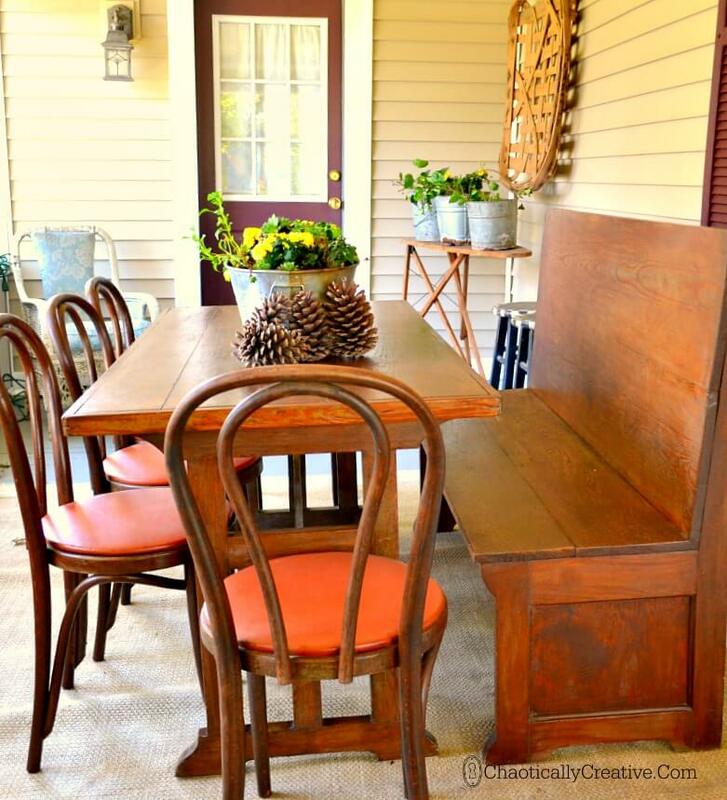 Turn your outdoor area into an inviting spot for guests with a farmhouse table with bench seating and chairs. This warm brown decor idea provides a lovely outdoor eating area with a dose of rustic charm. Whether you are having a barbeque with the whole family or a simple breakfast outdoors, this space is perfect for outdoor entertaining. Talk about comfy and cozy, this room gives me all the farmhouse feels. The grey sofa with beautiful cream accent pillows provides a comfy space for guests to relax while the gallery wall serves as an opportunity to share memories. The lighter brown shades blended with the grey sofa and white walls give off that cozy oasis atmosphere. 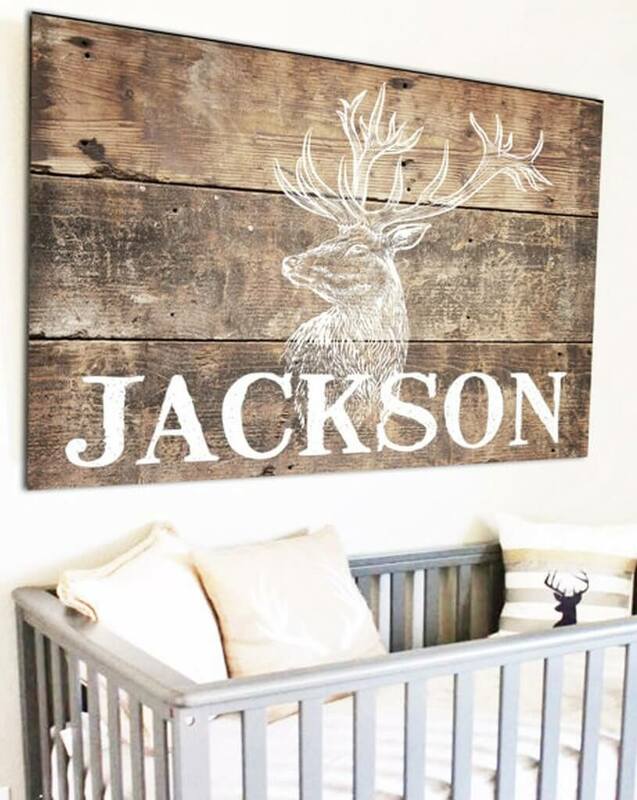 If you’re considering the rustic look for your nursery, warm woods, natural textures and a dose of woodland animals are a must to complete this popular design scene. The neutral crib and bedding allow the wooden pallet sign to be the focal point of the room. There’s so much rustic charm here, I am loving this look! 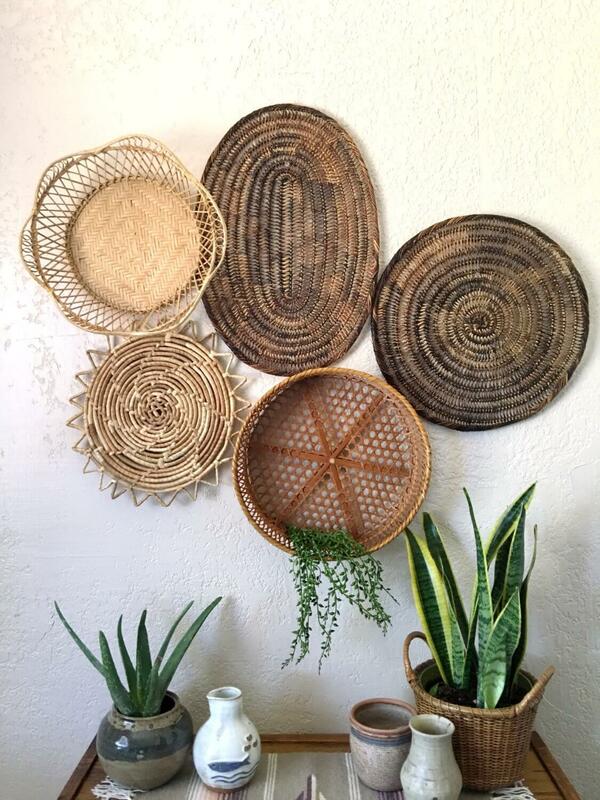 Most people have a few random baskets laying around, but we don’t usually consider them to be an accessory or focal décor piece which is why an art gallery wall using baskets is so intriguing. 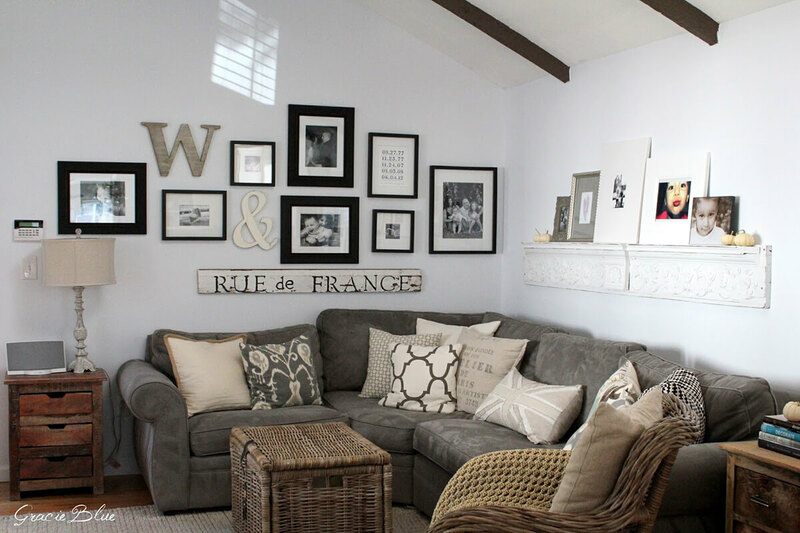 This gallery wall is so eye-catching and gives a little global décor style into your home.